Straight to the point → White artists, black subjects. 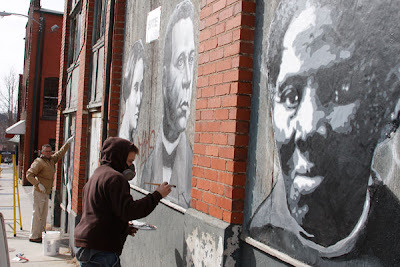 This past month, murals of historical Black Americans are being displayed in an old delapitated building across the street from the YMI cultural center at 39 South Market Street that is the last of the last for the African American population in downtown Asheville. 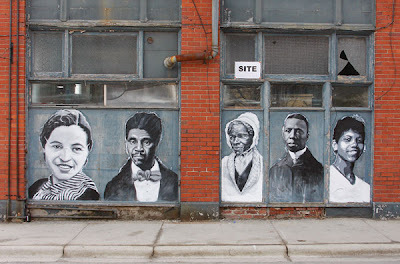 These images are of historical Black Americans (Harriet Tubman, Martin Luther King Jr. Wilma Rudolph, Sojourner Truth ) created by local white artists. Yes, it is productive to display the images of faces who broke barriers for the African Americans, however; what exactly is the point of these pictures? Is it to evoke emotion? To remember the ones who laid down the foundation of civil rights? To remind the predominately white downtown population to remember Asheville and America’s black history. The murals are located on the intersection of Eagle and Market Streets, in a neighborhood where the black population once actually populated. Today, the neighborhood is being swept away, rejuvenated some would say (although the term doesn't quite address the lack of the blacks.) It is a sensitive subject for many, with gentrification written all over. Gentrification; sweeping away the locals to stimulate the local economy. Gentrification; out with the old, in with the new. Gentrification; to “beautify” something that was once beautiful within itself. Here in Asheville, there is an unsaid separation between the blacks and whites. With an African-American population of about 18%, where exactly are the African-Americans downtown? Their faces are displayed in the mural project, provoking questions about their presence. Are these images helpful or harmful? Harmful in the sense that they are their to represent strength but being swept away by gentrification. Helpful in the sense that they get people thinking. These images are powerful, representing history, but it may be just that. Black History Month calls upon us to think about how far we have come, how civil rights are in the past, but somehow they are still lurking in the present. Presently, the only reminisce of the African-American population downtown are in the images in an old condemned building, which is in the process of being renewed and turned into something to cater the community; out with the old, and in with the new.